The largest solar power plant in Japan has just been launched. 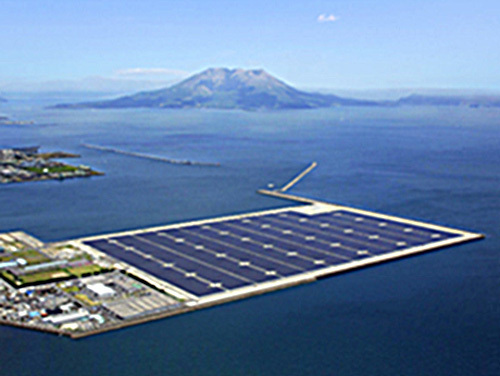 The Kagoshima Nanatsujima Mega Solar Power Plant is situated just offshore in Kagoshima Prefecture in southern Japan. The 70 megawatt solar power plant will be able to provide enough electricity for the equivalent of about 22,000 average homes. The solar plant was developed by Kyocera Corporation in partnership with 6 other companies, and the power generated by the new plant will be sold to the national grid through a local power utility. The development of this substantial solar project was helped along by Japan’s updated feed-in-tarriff program. After the Fukushima nuclear disaster the program was upgraded to encourage an increasing amount of solar energy. The updated program requires power utilities to buy all of the power generated by solar power plants that produce over 10 kilowatts of electricity. The floating solar power plant includes an adjacent “tour facility”, which is open to the public. It has a elevated, circular room for viewing the 290,000 solar panels, as well as panoramic views of the bay with Sakurajima volcano in the background. The tour facility also displays educational information about environmental issues and solar power. According to Kyocera, as well as making money, it is hoped that the whole project will help to “foster a deeper understanding of renewable energy and further facilitate a low-carbon society”.